During the 1860's Vicksburg, Mississippi, was a thriving commercial and industrial center. The city was well fortified, and its location overlooking the Mississippi River made it extremely important. From a vantage point on a bluff above the river the Confederate Army was in a position to permit or deny passage. At the time, Confederate forces moved their supplies freely up and down the river without interference. However, that would soon change after Union leaders realized the importance of the river as a transportation line. If they controlled it they could move their own supplies and troops on the river. Before long, the Union dispatched gunboats northward. At the same time they sent iron clad vessels southward from Illinois. At first, the ships traveled along the river unopposed as the South had very few boats, but that didn't last long. A short time later they found themselves being bombarded by Confederate cannons that had been strategically placed on high ground in a series of forts. Unable to proceed, the Union ships were forced to use ground forces to neutralize the enemy. Then, in February of 1862, Captain David Farragut and his forces captured New Orleans. This gave the Union Army control of both ends of the Mississippi River, but still not the interior. No one understood Vicksburg’s importance more than President Lincoln. Lincoln emphatically stated, “Vicksburg is the key! The war can never be brought to a close until that key is in our pocket.” Again, Lincoln chose General Grant for the job. Grant's first campaign against Vicksburg lasted from December 27, 1862 until January 3, 1863, and it ended in total failure. The Union forces had 208 killed, 1005 wounded, and 563 captured . The Confederate forces did much better only having 63 killed, 134 wounded, and 10 unaccounted. Then in April, General Grant came up with a new plan using both land and water forces. Before long, Admiral David Porter made it past the Vicksburg batteries with 12 ships, losing 1. Then, just a few days later another supply flotilla made it past. Next, Grant took his army down the western banks of the Mississippi River to the town of Hard Times where he assembled 41,000 men. There under the protection of Admiral Porter's gunboats Grant transported his men across the river. 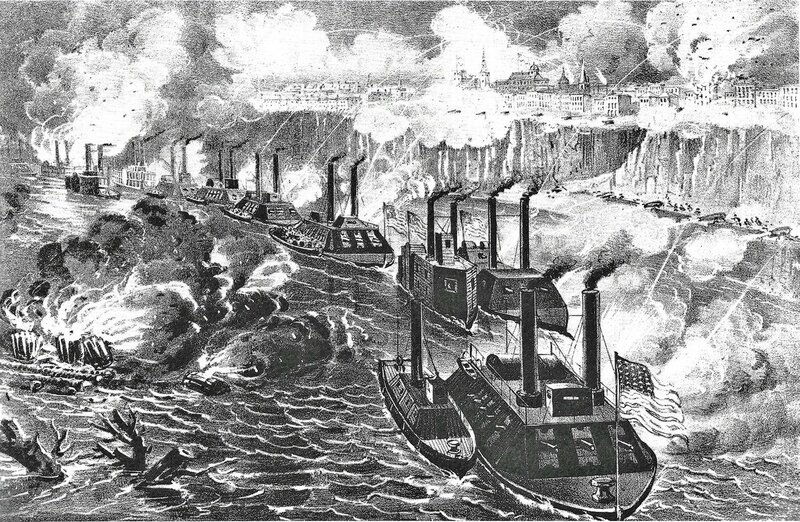 The plan was for his men to attack Vicksburg from the southern and eastern approaches. At the time, Vicksburg was being held by General John Pemberton and 30,000 troops, and they were deeply entrenched all over the city. Before attacking the city, Grant secured his rear by defeating the Confederate forces in Jackson. Then on both May 17th and May 22nd, Grant tried straight forward assaults of Vicksburg, but he was badly defeated. His losses were horrible, in all 3,199 men, while the Confederate forces suffered much less losing under 500 men. The deep narrow trenches that surrounded the city had made it impregnable. After the loss, Grant tried a new approach. He ordered his men to blockade all water and land access in and out of the city, cutting off all of the supply lines. He had decided to starve them out in a siege. Eventually, the constant bombardment, hunger, and disease forced General Pemberton to surrender on July 4th. Then one by one the other Confederate forts that lined the Mississippi River gave up. Soon afterward General Grant sent word to Washington D.C. that the Mississippi River was theirs. The victory was especially important because it effectively divided the Confederacy into two parts that no longer had the ability to support each other.